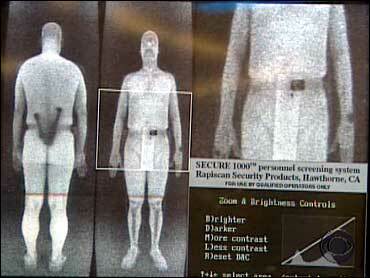 Almost three quarters of the American public are in favor of full body x-ray scanners at airports, according to the findings of a new CBS News poll conducted in the wake of the failed Christmas Day bombing attempt on a flight from Amsterdam to Detroit. Of those questioned, 74 percent said airports should use the controversial machines because they provide a detailed check for hidden weapons and explosives and reduce the need for physical searches. Just 20 percent said the machines should not be used because they see through a passenger's clothing and thus constitute an invasion of privacy. Racial and ethnic profiling of passengers at airports received less support, with just over half (51 percent) saying added security checks for passengers from certain ethnic or racial groups is justified. Thirty-eight percent said such profiling was not justified. Views on racial and ethnic profiling have changed little since a previous CBS News poll in 2006. President Obama's response to the attempt on Northwest flight 253 won the support of more than half the public, but those views were highly partisan. Fifty-seven percent of the Americans questioned by CBS said they approved of the way the Obama administration responded to the attempted terrorist attack, while only 29 percent said they disapproved. The ratings are better than recent measures of President Obama's overall approval. However, when broken down on party lines, 75 percent of self-professed Democrats said they approved of how the President handled the incident. Just 41 percent of Republicans said the same. • Men were more likely (51 percent) than women (48 percent) to say racial or ethnic profiling is justified. Older Americans were also more apt to support it. Partisanship also factors into people's views: 62 percent of Republicans supported profiling at airports while just 42 percent of Democrats did so. • Those who spend the most time in the air - roughly one in ten Americans - also were more apt to support profiling. 62 percent of self-described frequent fliers said more rigorous checks for certain groups of people by airport security are justified, compared to 49 percent of those who fly occasionally or never. • Additional airport security checks are viewed as going only so far in preventing terrorism. Four in five Americans think if the government required even more comprehensive screening procedures in airports that would be effective in stopping future attacks, but few - just a quarter - said it would be "very effective."